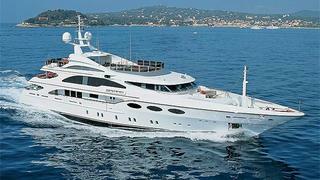 Patrick Coote at Fraser Yachts tells me that Massima Piras has signed the 52m motor yacht Sai Ram to the charter fleet. Sai Ram is a 52m Benetti launched in 2004. Sleeping 12 guests in six cabins, her sundeck is divided into three distinct areas. Forward there’s a sundeck with tables and backrests – which also doubles as a helipad for emergency use – a Jacuzzi and bar, while the central circular dining area can seat 24 to 28 guests at three separate dining tables. Finally the aft area is devoted to sunbathing. Sai Ram is available for charter at new rates starting from €215,000 in high season and €199,000 in low season.